A former supporter of senator and presidential candidate Elizabeth Warren said he walked out of the speech announcing her candidacy because the Massachusetts Democrat was placing too much emphasis on raising taxes, and not talking enough about issues of equality and opportunity for minorities. Johnhaynes Honeycutt says he previously was a Warren supporter, "But I found at the event there wasn't any way for me to identify with the things she was saying. That was why I walked out." Bailing out of the speech by Honeycutt and his girlfriend caught the eye of many because speeches announcing a presidential candidacy are usually carefully managed to create positive images and avoid potential embarrassments. "She's a small-town girl, and her family were blue-collar, and now she's in this position [as a presidential candidate]," he told the Washington Examiner. "Rather than taxing and fighting the rich and using that as her only focus, she should be focusing on opening up opportunities for the people that are in the same position she was once in," he added. Honeycutt is African-American and also a small business owner in Massachusetts. "There are so many minorities that are doing well in this country, and I feel like Elizabeth Warren should be using her platform to illustrate that end of it," he said. Issues of minority opportunity have dogged Warren as the senator recently apologized for her decades-long practice of identifying herself as Native American. Conservatives and others have argued Warren did so to provide her an advantage for jobs she applied for over the years, such as her work as a law professor at Harvard. Her hometown paper the Boston Globe has been critical of her past in this regard, urging the senator to be as transparent about her claims of Native American ancestry, especially after a new report by the Washington Post showed a registration card with the Texas bar from 1986 in which she clearly listed herself as "American Indian" in her own handwriting. "Warren grew up believing she was part Cherokee," the Globe wrote. "But answering the question the way she did was a mistake, even by the standards of 1986. Warren's never been a member of any tribe. She's white. Playing loose with the facts about identity is bad within the current political climate of the Democratic Party, where issues of race have come to the fore." 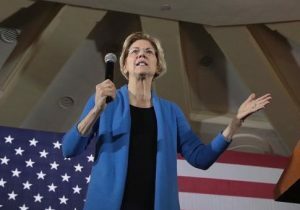 Warren's announcement speech largely tried to paint a theme of a "rigged" America in which the idea of a meritocracy is either a ruse or is broken, and often tried to use President Trump as an example. "[He's] a product of a rigged system that props up the rich and powerful and kicks dirt on everyone else," she told the crowd last Saturday. "Once he's gone, we can't pretend that none of this ever happened," she said. "It won't be enough to just undo the terrible acts of this administration. We can't afford to just tinker around the edges, a tax credit here, a regulation there." The Trump campaign was quick to respond to the speech. "Elizabeth Warren has already been exposed as a fraud by the Native Americans she impersonated and disrespected to advance her professional career, and the people of Massachusetts she deceived to get elected," Trump campaign manager Brad Parscale said in a statement.